This treatment is completely natural and doesn't depend on oils or lotions to achieve the results. Rejuvinating Face Massage aims to promote a relaxed, more mobile and youthful appearance by toning and firming facial muscles and increasing elasticity and improving skin tone. And by the end of your treatment, you'll have the extra benefit of feeling really relaxed. It acts as a gentle exfoliating treatment, encouraging dead skin cells to slough off, revealing newer skin cells and creating a fresher complexion. Indian Head Massage is done sitting in a chair, fully clothed and uses no oils or lotions. 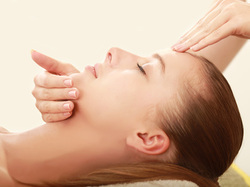 Massaging the head is a powerful act and offers an opportunity for the individual to relax. Massage of the shoulders, neck, scalp and face help to reduce muscular and nervous tension and improve circulation of blood and lymphatic fluid. This helps oxygenate the cells and stretches and mobilises the tissues of the neck and shoulders and stimulates scalp circulation.